Dacia – Renault’s budget brand – have amassed quite a lot of fans in recent years, and it’s probably the case that the new Dacia Sandero Stepway is going to welcome in even more fans. It’s spacious, well equipped and acts as the ideal family car for those operating on a budget. Let’s take a closer look at what the new 2015 Dacia Sandero Stepway offers. Engine choices are limited and come down to a straight face-off between a petrol and a solitary diesel. The petrol is a turbocharged 0.9-litre unit that develops 89bhp. To be fair, this is a decent little performer but it does come with its flaws. You need to rev hard to get the best out of it, and once you have got the best of out it, it’s not the best at reverting back to cruising speed. It can get to 62mph from rest in 11.1 seconds. The 1.5-litre dCi 90 diesel, on the other hand, gets to 62mph from rest in a slightly longer 11.8 seconds en route to a max speed of 104mph. The diesel unit has more punch and flexibility, and is probably the safer option if you’re going to be zooming up and down motorways. One of the flaws of the 2015 Dacia Sandero Stepway is that it’s not easy to drive at low speeds because the steering is surprisingly heavy. So when you’re mooching around traffic or trying to park, the car can get a bit exhausting. Still, if you’re going to be nipping along straight lines, you’ll find the new 2015 Dacia Sandero Stepway to be a smooth, quiet companion which also offers dosing’s of comfort. It’s not the most fun hatch to drive, but neither is it completely dull either. Whichever engine you choose will prove to be a decent little performer, and whilst you’re not going to have an absolute ball driving around one of these, what you do get is hard to argue when you consider the price tag. 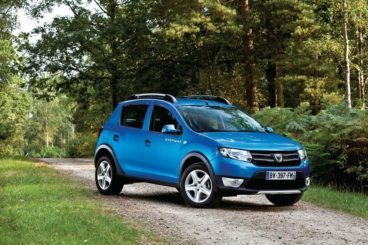 The 2015 Dacia Sandero Stepway is quite a big car, so one would assume that it’s going to offer a fair amount of practicality – and it does. Let’s not forget that this car is technically a supermini, so it’s 320-litres of boot space is actually pretty generous. Moreover, this space can be extended to 1,200-litres if you fold the rear seats, ensuring that it’s one of the biggest in its class. The car is also family friendly too, and offers door bins and map pockets to accommodate a few of your needs. Styling wise, the new Dacia Sandero Stepway looks very understated and rather rugged -kinda like an SUV. It looks bigger than last time, and comes with an increased ride height of 40mm. The extra bulk comes from plastic cladding for the sills and wheel arches, while there are also new chrome roof bars too. It feels more upmarket than the basic Sandero, and this time around there is no ultra-budget Access version. 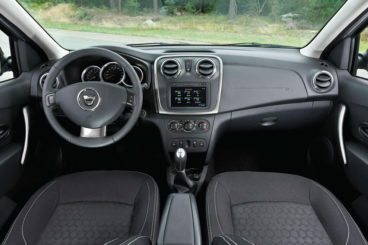 Indeed, there are only two models in this range – the 2015 Dacia Sandero Stepway Ambiance and the Dacia Sandero Stepway Laureate – and they come with four plastic wheel covers that, although not alloys, they do a good job of looking like alloys. 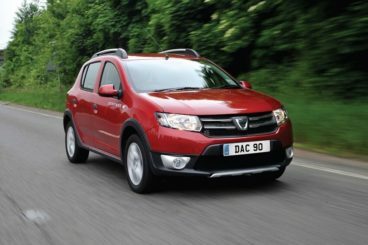 The new 2015 Dacia Sandero Stepway price range starts out from around £8,395, whilst the 2015 Dacia Sandero Stepway for sale price rises to £10,995. 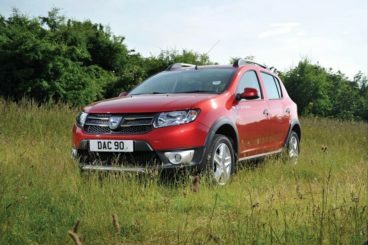 Buyers will be able to get hold of a used Dacia Sandero Stepway and a second hand Dacia Sandero Stepway for a little bit less. There are two trim levels available – the Ambiance and the Laureate – whilst missing from your 2015 Dacia Sandero Stepway deals will be a good amount of equipment; this is a budget brand, and despite how good a car it is, something had to be missing to justify the price tag. And so buyers will have to do without air conditioning and cruise control, as well as everything else you could think of. There aren’t too many options either, with air conditioning only coming with the Laureate. Still, the car is affordable and is also cheap to run, with the petrol engine returning 52mph whilst emitting just 124g/km of CO2, leading to a road tax bill of £110 per annum. The diesel, conversely, emits 105g/km of CO2. 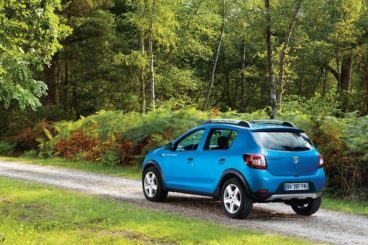 In the past, buyers would pick up a car like the Dacia Sandero Stepway used and save the rest of their cash. These days, Dacia have those same people reconsidering. The new Dacia Sandero Stepway is indeed, dirt cheap and any Dacia Sandero Stepway forum will tell you that what you’re picking up for less than 10k is an absolute bargain. Because while the brand may have scrimped on equipment, they’ve developed a good performer that also looks pretty good and offers up a reasonable amount of practicality. A car like this will always have its critics, but it’s hard to argue with the kind of interior, comfort and space you’re given for such a low price. 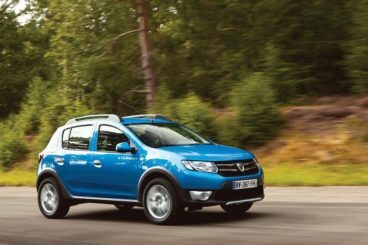 If you want to get hold of the new 2015 Dacia Sandero Stepway don’t hesitate to leave us a message on our contact page, or give us a call on 01903 538835 to find out more about our Dacia lease deals.